This week's wish-list is based around Truffle Shuffle's graphic tee's, when I first found this store back in '08/09 I was in the middle of my teen years and obsessed with the idea of graphic tees, mainly because if they included my favourite childhood cartoons, films and tv series I wanted them…because, well no-one else at the time really wore them, mainly as they were pretty rare finds in the UK, that or I wasn't good at online shopping! So I wanted to focus on these old favourites for my younger self, even at the age of 21 I'm still in love with these tees which have become extremely popular recently! I've stopped wearing this style of shirt as my everyday clothing, instead these are typically my lounging t-shirt or used for my pjs. I tend to wear them when I'm feeling a little sorry for myself, I just love the comfort, that and I use all my graphic tees for my dance lessons and my gym/aerobic sessions, typically over-sized, and I also roll my sleeves up, standard sarah. These t-shirts I've picked this week, mix my love for childhood memories, some recently favourites and of course disney! Honestly I can't see myself wearing the vintage tee, however it's adorable and pretty 'cool'. I'm a little bit of a self-confession childhood fanatic, anything that reminds me of my childhood/'younger' years I'm obsessed with and well I can see so many of my old toys just at glance of this tee. I'm not sure if I'd be given funny looks if I ever did purchase the neighbours t-shirt, but I've had my eye on it for a while now, I've been watching neighbours for years now (seem to be the only one of my age range that does) but I'm obsessed…would be hilarious to see who would know the name on my tee when out and about, hehe. I watching the documentary about the voice of elmo, and ever since I've been in love with the little puppet, how cute would it be to have your own little elmo hanging out with you in your pocket. I'm in love with the pinky and the brain tshirt as it combine my love for a childhood classic with a new classic of breaking bad. Snow White and sleeping beauty make the list for obvious reasons, while the video tapes one reminds me of the years of VHS....this is just a throwback wish-list really isn't it! I love truffleshuffle.co.uk so much, that every so often I'll pop onto the site and see what new things available, not only do I look at the clothing but I also look at the jewellery and the home-ware, so I'll definitely be using this site for more wednesday wish-lists in the future. These are such great picks! I love clothes with toys and TV shows from the nineties - they make me so nostalgic! 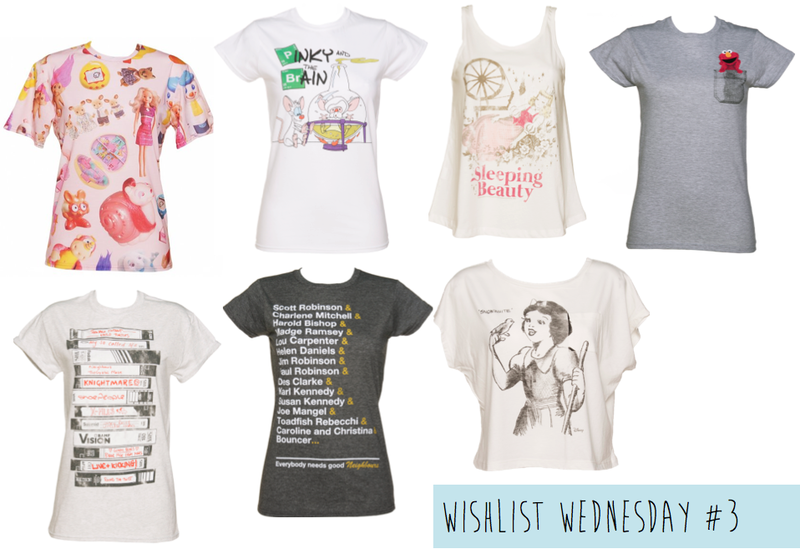 I especially love the Disney tops - the Snow White one is gorgeous. I love all of these tees, they're so quirky! I love tees like this, one's that make us nostalgic, or are a little geeky! I think I sparked my own addiction too, but whenever I'm struggling for gift ideas this tends to be the site I'll check out first, such great items! it's so cute & so simple! I love it too! I haven't worn a vest tee for a while so I wish I could purchase it!